Scott Pruitt is so toxic he’s practically a Superfund unto himself. The Environmental Protection Agency administrator has been buffeted by myriad ethical scandals, from cozying up to those he’s supposed to keep in check to general press hostility, spending $24,450 to build a “privacy room”, unanswered FOIA requests, buying a bulletproof desk, and getting a senior aide to buy a used mattress. We at Earther even have a growing list of the administrator’s misdeeds to keep you routinely updated. With the headlines detailing Pruitt’s scandals growing ever more bizarre (witness his newly-unearthed obsession with Ritz-Carlton lotion), it’s hard to predict what outlandish offense we’ll hear about next. 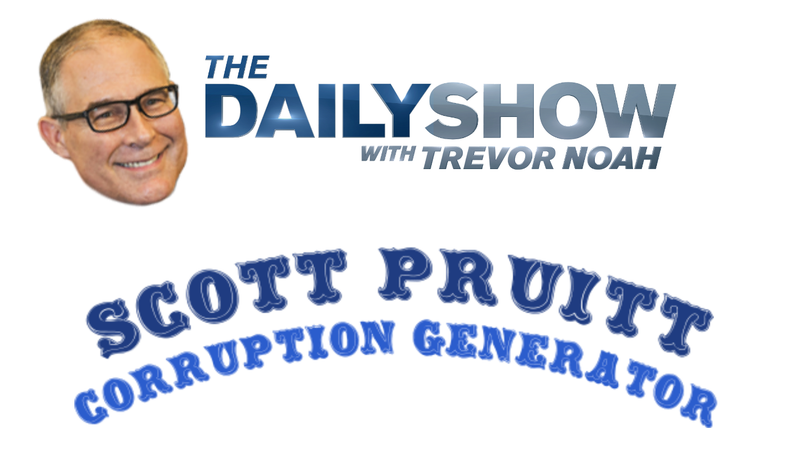 Which is why, after last night’s episode of the Daily Show with Trevor Noah put Pruitt on blast, the show released a Scott Pruitt Scandal Generator to try to foretell the next headline. The headlines are both hilarious and unsettling, because at this point, reality and parody have become so blurred that literally any of these scenarios is conceivable. Who knows, maybe a few of them have happened!